Here are three cello sonatas by composers just on the brink of establishing their own voices. Zoltán Kodály, by the time of his Opus 4 Sonata, had pretty much found the manner of expression he would favor through the rest of his career; in contrast the sonatas of Richard Strauss and Ernö [Ernst von] Dohnányi are journeyman works still strongly influenced by the German romantics. 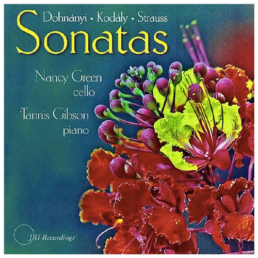 Dohnányi’s music would retain that influence for decades, continuing to find vitality in the style; Strauss would go on to establish a reputation as a boisterous, bombastic radical, but he never fully broke with the traditions from which he emerged, traditions that permeate his cello sonata. These Strauss and Dohnányi sonatas reveal the composers’ heightened consciousness of the their heritage, without seeming derivative.